In an email to OCCC faculty and staff, college president Jerry Steward said the state’s budget crisis will cause millions of dollars worth of cuts to be made in Fiscal Year 2018. Steward said the budget hole stands at about $900 million. Steward said OCCC is preparing for cuts as deep as 14 percent. “As we prepare for Fiscal Year 2018, I have asked Dr. John Boyd, Chief Financial Officer, to plan for a reduction of approximately 14 percent. This will result in an estimated additional 2.8 million reduction to OCCC’s budget compared to FY 2017,” Steward wrote. The president said the cuts will result in some positions not being filled. He said some faculty and staff may be let go. As of Wednesday afternoon state lawmakers were looking at funding cuts of 4.5 percent for the higher education system. Mark Faulk, a member of Red State Revolt, a progressive advocacy group, said that the recent budget cuts will equally affect all of higher education. “The state money given to colleges and universities is across the board,” he said. Faulk said that when education funding is cut the school has to lay off employees, cut programs, and possibly raise tuition for students. “Every time they do another cut at the college level, they increase the cost for students.That’s why students have $50,000 in student debt,” he said. Erick Herrera, a performing arts major at OCCC, said budget cuts make it harder on low- income students the most. “It affects the majority of low-income students, because they are the ones who need financial assistance. We all pay taxes to have the best quality of life for us and our people, not to fund the rich,” Herrera said. The FY 2018 budget proposal cuts corporations a tax break of $140 million and reduces appropriations for higher education from $810,022,102 in 2017 to $773,597,660 for 2018 — a cut of 4.5 percent. Herrera believes this could make students rethink applying for college. “You have to study in order to get a good job, but you have to work to study, and survive,” he said. The problem for low-income students, Herrera said, is that they often have to choose between an education and supporting themselves or their families financially. “Education should not be a [problem] for those who seek it, it is the government’s responsibility to help the students,” he said. Dana Glencross, a political science professor at OCCC, said the legislature’s joint committee on appropriations cannot pass a new bill that raises new revenue in the last five days of the legislative session. “They were unable to come to an agreement for any bill that would raise any revenue including common education teacher pay, which is really unfortunate,” she said. Glencross said programs and other state-funded organizations thought their funding cuts would be higher than the 4.5 percent proposed Wednesday morning. She said that OCCC could avoid raising tuition if the 4 percent funding cut proposal is adopted. Wednesday afternoon Oklahoma Governor Mary Fallin said the proposed budget avoids big cuts to core services. Fallin said a handful of agencies would see an increase in funding. “This plan keeps our government from shutting down. It is not an ideal budget, but it avoids draconian cuts to our core services such as education, health, and human services, and public safety,” the governor said in a prepared statement. Fallin warned lawmakers that next year they will face $400 million in debt caused by non-recurring funds, and $100 million in obligations due by next May. State lawmakers had until 5 p.m. Friday to complete their budget agreement. 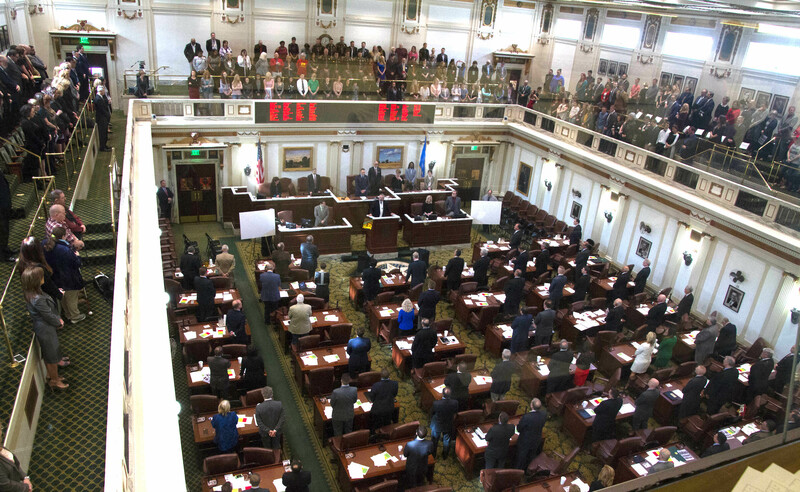 The Oklahoma legislature adjourns sine die Friday.